I’m SO excited to share the trailer for my debut picture book NINJA BUNNY! While I had a blast making the trailer, it was not without its challenges. Ninja Bunny is spectacularly sneaky and difficult to capture on tape. I spent days filming in stop motion, hoping to gain evidence of his mischievous behavior. Luckily the wait paid off and I’m now able to prove what this ninjamazing bunny is capable of. I only hope that one day I can reclaim the Random House logo he stole from me. The book follows the story of our bunny friend as he tries to navigate the rules of becoming a super awesome ninja. Writing and illustrating NINJA BUNNY was an amazing experience and I hope everyone loves him as much as I do. Thanks for reading and thanks for watching. And a super awesome, ninjariffic thank you to Mr. Schu, for debuting the trailer! A fresh, funny, and hip picture book about a little bunny who wants to be . . . a ninja! · Rule #1. You must always work alone. · Rule #2. You must be super sneaky, especially in the most dangerous of situations. · Rule #3. A super awesome ninja must: possess incredible strength, achieve invisibility, master the skill of climbing, gain the ability to fly. . . .
Our little bunny is ready to embark on his path to becoming a ninja. But is he cut out for the ninja life? Especially if it means leaving his friends behind? 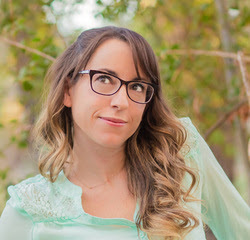 Jennifer Gray Olson is a children's book author and illustrator based in Southern California. Her love of creating entertaining characters and the worlds in which they live led her into illustrating. Her work is created through a combination of ink and watercolor. She lives in Corona, Ca with her husband, three children, and too many pets. 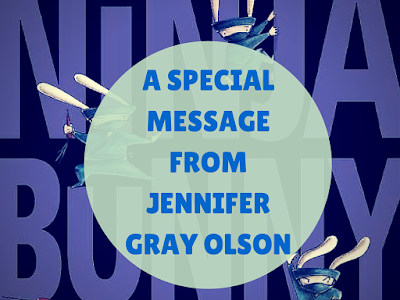 Borrow Ninja Bunny from your school or public library after June 9. Whenever possible, please support independent bookshops. Happy Saturday, Mr. Colby Sharp! Happy book birthday to Circus Mirandus!